Okinawa Prefecture Museum’s latest exhibition is anything but dull, as the Jintai Plastomic: Mysteries of the Human Body displays are being described by visitors as “grotesque”, “fascinating” and “creepy”. The Jintai Plastomic: Mysteries of the Human Body exhibition is in the Prefecture Museum’s Art Museum on the 3rd floor, and runs through May 17th. The exhibition has toured elsewhere in Japan and overseas over the past several years before arriving in Okinawa last month. The Jintai Plastomics process takes human bodies, cadavers, and uses a plastination process to preserve them. 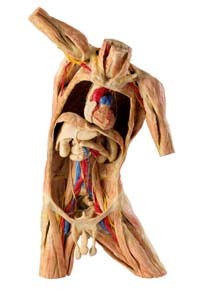 The Jintai Plastomics exhibition is modeled after a Body Worlds exhibit in Tokyo 13 years ago. Doctor Gunther von Hagens first perfected the plastination process to maintain cadavers for medical and scientific uses. In the current exhibition, Chinese bodies have been dissected and preserved in a Chinese laboratory. The exhibition is open 9 a.m. ~ 6 p.m. Tuesday through Friday, and 9 a.m. ~ 8 p.m. on Fridays and Saturdays. The museum is closed on Mondays, and will also be closed May 7th. Visitors must enter the gallery at least one-half hour prior to closing time. Advance adult tickets are ¥1,200, or ¥1,400 at the door. Tickets for 12-18 year olds are ¥500 advance or ¥700 at the door. Children’s tickets are ¥200 in advance or ¥400 at the museum. The Okinawa Prefecture Museum is offering special prices for groups and disabled people. Tickets for groups of 20 or more are ¥1,100 for adults, ¥500 for those 12-18, and ¥200 for children under 12. Tickets for the handicapped/disabled are ¥700 for adults, ¥500 for those 12-18, and ¥200 for children under 12. Savings passes are ¥1,200 for adults, ¥500 for those 12-18, and ¥200 for children under 12.